Visit our garage in Port Moody! Your braking system is probably	the most important system in your vehicle. Stopping safely and smoothly requires	all components of your braking system to be operating correctly and in	conjunction with each other. If they aren’t, your car might pull	to the right or left or fail to stop in time, therefore causing you to	get into a collision. 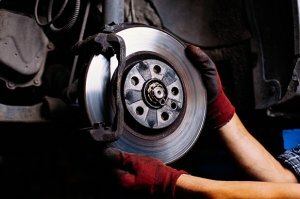 Let our professional Red Seal-certified mechanics at	Vancouver Brake & Wheel Ltd keep your brakes in shape! Most of us don’t think about our brakes until they start complaining. Whether that complaining is just an occasional squeal or a loud grinding	that you can’t ignore, it’s better to repair the problem sooner	than later – for the sake of your safety and your budget. For brake	work and all of your Port Moody garage needs, come and see us at Vancouver	Brake & Wheel Ltd! You can	contact us at (604) 461-3258!